Rokkaku is a rather interesting restaurant in Polanco – although both the name and the decor suggests that it is a fully Japanese restaurant, however in actual fact, it is a Peruvian-Japanese restaurant or Japonesa Nikkei as it is called in Peru. 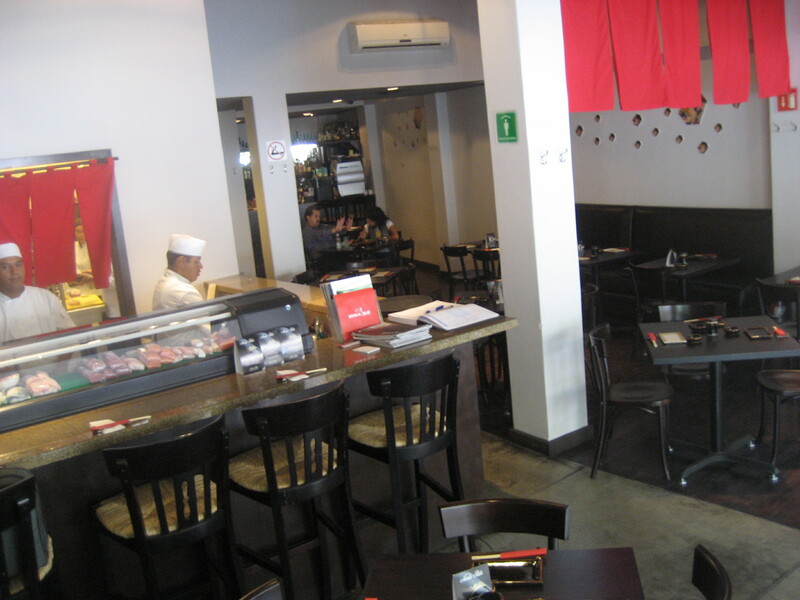 ‘C’ had seen an article about this Nikkei restaurant Rokkaku in the Peruvian online newspaper El Commercio, and it turned out that it was in our neighbourhood of Polanco – so we just had to go and give it a try. Our first impression of the restaurant was one of slight scepticism and pity. We had walked past it the night before which was a Friday and it was DEAD. There was not one single customer on the premises, when all the other neighbouring restaurants were a buzz with activity. 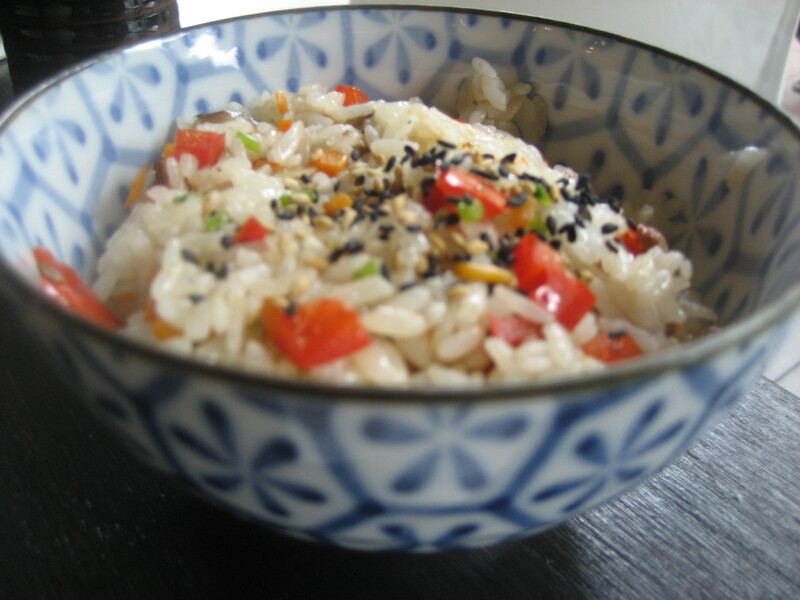 However, when we went there the following day for lunch, there was a little bit more life – which was reassuring. The waiters and staff were incredibly friendly and attentive and we were directed to a sunny table for two inside, by a large window looking onto the pavement and the hustle and bustle that is Polanco on a Saturday. The menu was quite extensive, so would take a while to go through it all, however in the mean time we took the waiters recommendation and ordered the ceviche. 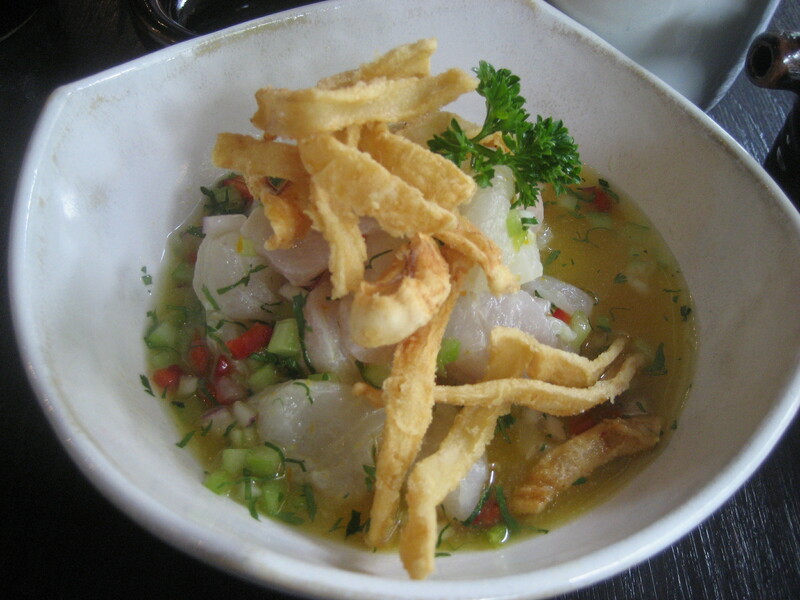 The ceviche was actually very good. The fish was fresh and firm, the marinade was not too tart and very refreshing, and you could taste the Japanese influence with the ginger and soya. My only criticism of this dish, was that it had deep-fried calamaries on top (which I love) but they had become cold and soggy – if they had still been crunchy this would have been an absolute winner as the flavours were all there. We then continued to order a few more dishes to share between the two of us. 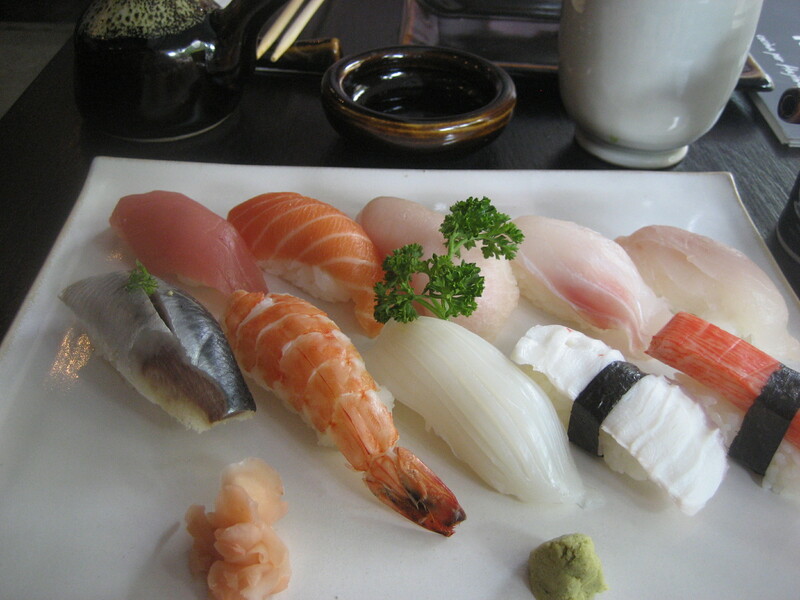 We ordered the nigiri platter, which was a variety of fish and shellfish, which was melt-in-your-mouth-fresh, especially the salmon. Followed by a variety of hot dishes such as wok fried rice, chicken yakitori and something that I thought sounded very interesting, lettuce tacos with beef. Unfortunately this was the only dish that I was disappointed in. 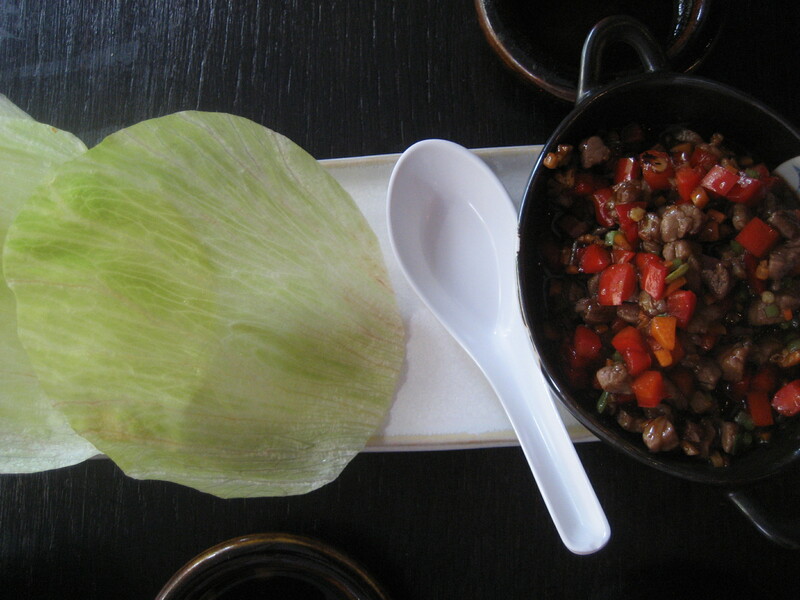 The concept was lovely and the flavour of the minced beef was good (although slightly sweet), but it just had a bit too much thick sauce for it to be practical to eat with a lettuce leaf! Overall I really enjoyed the food at Rokkaku. To be honest, apart from the ceviche there was nothing exceptionally ‘Peruvian’ about this restaurant, it could be any normal Japanese restaurant outside of Japan. I do feel as though they have missed a very good marketing opportunity here, however the food was incredibly fresh, neatly presented and the service was excellent. The ambiance of the restaurant was light and airy and I absolutely love the fact that there is not one television screen in sight (my pet peeve here in Mexico). Although one thing that struck both ‘C’ and myself as odd was the sushi counter – all the fresh fish that was on display was tightly wrapped in cling film which does not look especially appetizing. But this was such a small detail and the fish was very fresh so I really should not complain, I guess it was more of an observation. However, I do have one niggling complaint that I have to air, and this is the sole reason as to why I would not return to Rokkaku in a hurry, and that is the price. I was very surprised at how steep it was! Between the two of us and the five relatively small dishes we shared, the bill came to over 840 pesos (US$71), this is without a drop of alcohol and on a normal Saturday afternoon. Unfortunately for Rokkaku, although the food was good, the casual ambiance and what is served does not match the ‘fine dining’ price you are presented with in the bill. It suddenly became clear as to why business seemed to be quite slow for them. If Rokkaku lowered their prices, maybe promoted their Peruvian aspect to differentiate themselves from the 3 or 4 other Japanese restaurants in walking distance from them, I am convinced they would have a roaring business on their hands and not sit empty on a Friday night, when everywhere else is heaving.